Lukas's last cycle - the end of a run or a fresh start? Everyone has been so hyped about the upcoming Mumbad cycle, however, alongside the heart warming news came a sadder story - it’s the last cycle of Android:Netrunner with Lukas Litzsinger as the head designer. Check out the Mumbad Cycle: fantasyflightgames.com/en/news/2015/7… The start of an end of an era: my last cycle as lead! Going to be awesome. There have been rumors about who the next lead designers will be but the general consensus is that it’s going to be Damon Stone and Erik Dahlman. So what does this mean to us, the community, the players of the game? One of Lukas’ biggest strenghts is that he has tried to shy away from overpowered cards and the result of it is the fact that Netrunner still doesn’t have a restricted/banned card list. Damon Stone, on the other hand, has been very controversial and not regarded very nicely by the community. What do these changes mean? Is Netrunner slowly going to die out, simply because of some cards that will be ridiculously overpowered and will end up being restricted? Or that the designers will get too excited and blown away and we will get too much strange card interactions that will make playing the game very messy? Or will the community just stop playing with the cards after cycle 4? Or are we painting everything in too bright colours and everything’s going to be just fine? Tournament scene is one of the reasons I jumped into Netrunner, having only played Warhammer:Invasion before that, when it was already a DCG. I do not want to experience another dead game or a very messy tournament system with a ton of restricted cards. I might just be afraid of changes but the threat is something we should consider nevertheless. Maybe GenCon will sort things out a bit. P.S. Can the forum Mods maybe redirect some posts from the Mumbad cycle in this thread? The discussion was a bit off-topic in there. Lukas is the lead for another 9 packs. Which is about 1/4 of the total length of Netrunner so far. We don’t know anything about the big box after Data & Destiny. Whether or not Lukas will be involved. Whether or not there will be any more big boxes. I don’t think it’s worth worrying about anything yet. Netrunner has really solid roots. I think fresh ideas might be good, I think what we’ve had so far is amazing. At some point Netrunner will probably lose impetus but let’s enjoy its growth until then. I’m going to choose to be optimistic for the time being. It’s a long way before we have to worry and I don’t think it’ll be too bad, Lukas is great but he was only a small part of the team. How are we supposed to know how non-Lukas cards compare to Lukas cards before seeing any non-Lukas cards? No doubt that Lukas has done a great job with Netrunner overall, but I think -and maybe I’m in the minority- that there are waaaayy too many coasters in the game right now. And while the new cycle looks really interesting, right off the bat we are shown another coaster that we’re lucky enough to get six copies! I have some mild concerns because both Game of Thrones 1.0 (Damon) and Star Wars LCG (Erik) are hot messes. Make of that what you will. Damon also brought us some really messy Caïssa and Call of Cthulhu cards. But the whole design team has done a fantastic job so far building up the Netrunner structure. Lukas may have been lead designer, but it took a lot more people than just him to bring us the game we know and love today. Both Damon and Erik already have at least one cycle’s worth of experience working on Netrunner, so I’m confident that they will handle the transition well. From a card pool perspective, they have a great baseline to work from. Fresh eyes always means new ideas, which are good for the health of the game. Looking at other card games, the first cycle under new management might be a little bumpy, but I can’t possibly inagine how that could “kill” the game. People like to play Netrunner. From a design process perspective, Netrunner has a lot of great systems in place. Cards are tested thoroughly in house (which I’m sure Lukas will be a part of). Cards are tested all over the world by playtest groups. Cards are edited and revised both in house and out of house. As long as none of those systems fall out of use, then it seems like Netrunner has a lot of life in it yet. The only scaffolding I’m worried about losing is getting rules questions answered. Tl;dr I’m a little worried, but I think Mumbad cycle shows that Erik and Damon have learned a lot, and I respect their work. I am confident that they will do a good job, especially if they keep making use of everything that makes Netrunner what it is (including the awesome community). ANR has a ways to go until it’s anywhere near as broken as ONR. ONR is still a BLAST to play, despite how utterly broken it is. So yeah, not worried at all. Hell, it’s not like there’s anything at stake here besides a few alt art cards and playmats. I don’t necessarily think that we have a whole lot to worry about. Fresh faces mean fresh opinions so we might see a lot of cool things and venture into unexplored areas. The thing is, even though Lukas wasn’t the only person in the design team, he was the lead and would dictate the growth of the game. I’m sure that they won’t go ham without him, though. You’re way overestimating the playtest teams. There are maybe two dozen people total? Being paid $90 per annum in FFG credit. Not a big operation. I didn’t say anything about how big it is, just that it is all over the world. A difference in perspectives matters. @jakodrako The biggest problem in my eyes is that the rotation is not aggressive enough to cover up a large mistake in a cycle. I guess they could make an exception if they recognized they did something wrong, but It’s something i doubt would happen. Any large mistake with a new set will not rotate for a long time. Compare that to MTG(the other game with rotating design teams), they have a huge testing team to prevent problems as well as a fairly aggressive rotation policy to get rid of stale formats or problem formats. I’ve got personal issues with some of the things that Damon has said that probably makes me biased against him. Here is to hoping that everything goes fairly smoothly and the game remains awesome, don’t particularly want the sky to fall. We don’t know anything about the big box after Data & Destiny. Whether or not Lukas will be involved. Whether or not there will be any more big boxes. I think we’re pretty sure that D&D will be the last deluxe box. 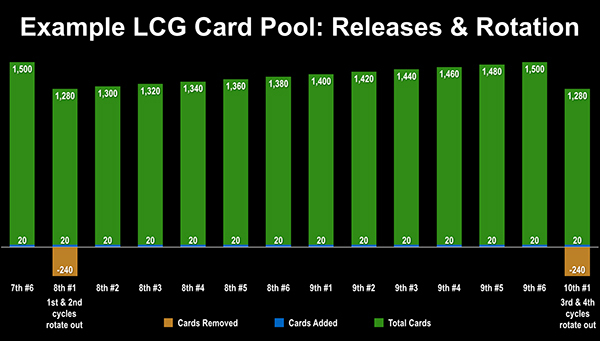 The numbers they released back in November regarding the size of the card pool once set rotation comes in strongly hints toward there being no more beyond this year. I guess they can always go back on that, but it also fits with what they’ve done in other LCGs, it’s basically one box per faction. leave damon alone. he is a visionary. end the run is a crutch and he was right about it from the start. At the point Damon said that it was nonsense. Non-ETR ICE just wasn’t taxing enough back then to have any impact and there weren’t enough playable cards that worked with them to allow them to support any other kinds of strategy. Two years down the line and we’re still not very far away from where we were in terms of what kinds of ICE are viable. If they want us to stop playing ETR then they need to stop printing good ICE with ETR. Marcus Batty might be an attempt to get people to experiment with other options. Lukas has said in interviews that he has deliberately kept the power level low to avoid creep, although he recognises a few cards in core have turned out to be better than originally anticipated. My concern with Damon taking over is that he has a track record of creating messy interactions in other games and if Caissa really were his idea then this has already been evidenced in Netrunner - they are about the most awkward cards to use in Netrunner and don’t interact properly with Scheherazade etc. He (in fact most of FFG) don’t really have a good grasp on how the game plays at the highest level, and that is dangerous because it’s the top-end players that are the ones capable of breaking the game. I don’t know anything about Erik so it wouldn’t be fair for me to comment. If Lukas is stepping down as lead designer, does that mean he won’t be involved in the game at all any more or will he still contribute? No doubt that Lukas has done a great job with Netrunner overall, but I think -and maybe I’m in the minority- that there are waaaayy too many coasters in the game right now. I agree, but don’t expect this to change under new leadership. Damon is already in the room watching as Lukas decides that Dedicated Technician Team might be overpowered if it cost 2 to trash. Better nerf it to 1 just to be sure, right? If he was capable of saying “that’s so far off base, did you even try” then he would have already. Instead he’s like “hur hur, good flavor text bro” and they ship it. The only reasonable solution here is for them to stop wasting so much of their time on crap like Star Wars and Descent so they can focus on high-level competitive Netrunner. That’s where all the REAL money is! as Lukas decides that Dedicated Technician Team might be overpowered if it cost 2 to trash. Better nerf it to 1 just to be sure, right? So true. This could have been an at least playable card, albeit one that still wouldn’t have seen a ton of play. But they just gave it a ridiculous trash cost and now nobody has ever played that card ever. I don’t necessarily think that they should abandon their other products in favor of Netrunner. They should, however, recognise Netrunner as it is - one of their main products and shoukd treat it as such. The numbers they released back in November regarding the size of the card pool once set rotation comes in strongly hints toward there being no more beyond this year. they said 1500 cards at peak, and then it would drop down 240 (and gain 20) after the first pack of the 8th cycle, ending up at 1,280.
not saying that there will be other boxes, but the math they showed allows for a much bigger card pool than we’ll actually have by the first rotation. But even if you add a big box for each cycle, you’ll only add 165 more cards, ending up at 1332. Either that chart is just using random example numbers, or something big is coming.